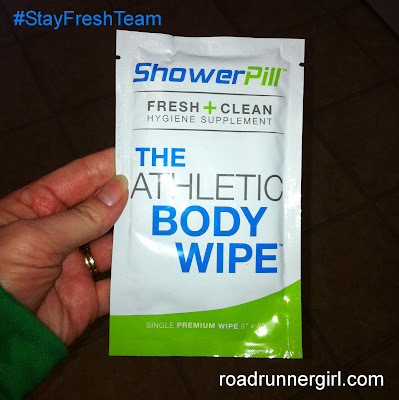 Road Runner Girl: ShowerPill Review...Stay Fresh and Clean! It's no secret that after a run I am pretty stinky. Especially a long run. And I sweat...a lot. After some of my runs I need to run some errands or go pick up a gallon of milk...you know what I mean. But most of the time I won't do these errands because I am too embarrassed that someone will "smell" me. I do NOT want to be the "stinky lady!" So when I got the opportunity to try ShowerPill I jumped on it! What is ShowerPill? No...it's not a pill that you take in the shower. It's an athletic body wipe. 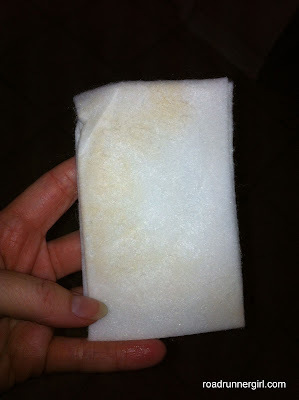 Kind of like a baby wipe but it's larger and much thicker. So on those days when I really want to stop by the store on the way home from the gym or after a run all I have to do is grab a ShowerPill so I will be fresh and clean (And so I won't get dirty looks from the people standing next to me in line)! It's a premium 9x8 inch, thick wipe that is packaged individually for when you are on the go. It will fit perfectly in your gym bag or purse and not take up any room. It is proven to kill germs and bacteria and had aloe and vitamin E in it. It is scented but the scent is fresh and not overwhelming. After a race when I have to drive home in my race clothes all stinky. After a run or workout when I don't have time to take a shower right away. These would have been perfect on our family camping trip with the cub scouts! I tried ShowerPill for the first time this weekend. I ran the Color Run on Saturday. And although we went straight back to the hotel for a shower, I DID use the ShowerPill to clean the color off my hands so it wouldn't get on everything I touched. Then Sunday I ran 18 miles...and was oh so stinky afterwards! I used the ShowerPill to wipe down after my run so I could enjoy my coffee without clearing the room with my smell lol! 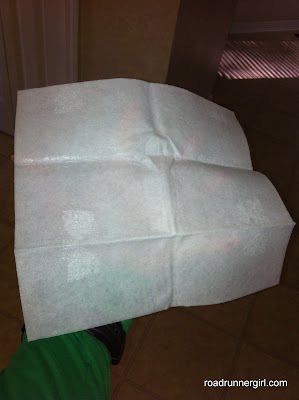 The wipe is a little larger than a baby wipe and much thicker! The directions say to fold it and wipe one area, then refold it to wipe another. See the yucky dirt I wiped off my body after my run? Yuck!!! I really liked using the ShowerPill wipe! When I rubbed it on my skin it stayed wet for a few seconds but dried pretty quickly. I didn't feel as clean as I would after a shower but I definitely felt cleaner and fresher. 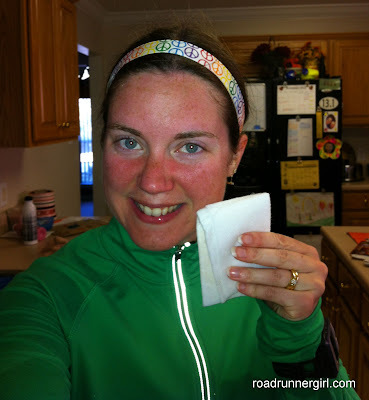 And the wipe smelled really clean...much better than my stinky self after a run! I will definitely be investing in these to use after races when I drive straight home in my running clothes. This is a perfect stocking stuffer for that athlete in your life (hint, hint to my hubby)! And you're in luck because ShowerPill is offering my readers a Buy 2, get 1 FREE Black Friday Sale on Amazon.com. To receive the discount you must place 3 boxes in your shopping cart and enter the code SPFRIDAY to receive the 3rd box free. Note that this offer is only valid 11/23 - 11/25! QOTD: What do you do to stay fresh and clean after a run or workout when you can't take a shower right away?